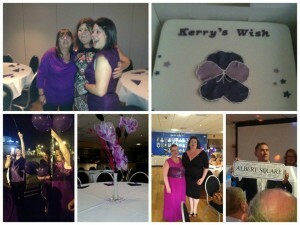 To hear that Kerry’s Wish on 20th June was a huge success and that everyone had a fantastic time. So far, the event has raised over £2500 for us which is absolutely fantastic. Well done and thank you to Alex Watts who worked tirelessly to organise this special evening. It was a lovely tribute to the wonderful Kerry Harvey. Kerry’s family, including her mum, dad, aunt and husband, were among the guests and we have no doubt that it meant so much to them all. Guests to the event included BGT semi-finalist Fabia Cera, Portsmouth FC legend Alan Knight, Eastenders star Cheryl Fergison and a Keith Lemon lookalike DJ. Thanks also to everyone else who attended and supported the event in various ways. Alex has plans for more exciting fundraising activities which we look forward to sharing with you soon.